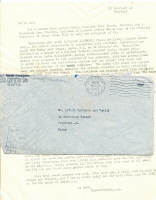 This letter was written by a corporal who was in the 40th Photo Reconnaissance Squadron. In the letter he is talking about his brother, who was a Marine, with the 305th Field Artillery, receiving the Bronze Star. 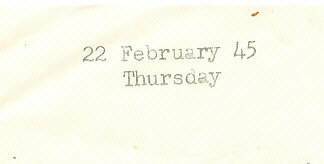 From the letter…..
Got a letter from Joseph today, also one from Jeanne, Frances, and a Valentine from Frances. Enclosed in Josephs letter was a copy of the official Citation. It reads this. This only one paragraph of it. Technician 4th Grade Davidson Field Artillery, Untied States Army. For heroic achievement in connection with military operation against the enemy near Ormoc, Leyte, Philippine Islands. On 11 December 1944, Technician Davidson as a member of a battery forward observer party, helped bring forward heavy radio equipment, across three-hundred years of particularly marshy rice paddies, to the position of the observer, this was accomplished in spite of heavy and continuous machine gun and sniper fire which had stopped the advance of the infantry. The speed with which the equipment was brought forward, enabled the forward observer to bring artillery fire quickly upon the enemy. The fortitude and courage under fire displayed by Technician Davidson were an inspiration to those working with him. Etc……..
Now what do you think of that. Our little Joseph. Ha…That I guess speaks for itself. Of course that was the citation that went with his medal. Now to answer his letter. Joseph, don’t tell me that you have rifle inspection too. Dam that sounds like the army. Inspection in places like that , calisthenics, what else. Dam that’s tuff. Your letter sounded down in the dumps. I hope you are not that way now. I hope, I hope. There isn’t’ much to answer, but Brother, “YOU MUST HAVE HAD IT.” and that’s putting it mildly. Not much in the line of news today. I’ve been unrestricted again. But I over slept a bit this morning, I got up quite late. It was dinner time. Bad boy, that’s me. We had a show tonight, and it was one of the worst hunks of stuff ever thrown together, it was named “Destiny” or something like that, and talk about corn. Wow, it was actually horrible. Why I ever came back from town to see that, is more than I can ever figure out. As I said, news is scarce here, as usual. I can’t get over those word s on Joseph’s Citation. The thought of it gives me the willies. I didn’t think I’d mind too much if I were there with him, but when I think of him doing it with our us there with him. That’s strange I know, but that’s about how I feel about the thing, Dammit. The way I figure it Joseph you have six months more before rotation. Is that true? Us Air Corps commandos know very little what actually goes on. You guys that do the fighting, really deserve all the breaks when this mess is all over, and I’m one guy that gonna holler about it too.